In 2017, Africa accounted for only two percent of global agricultural insurance, guaranteeing that most smallholder farmers would be at risk of losing their crops due to either drought or heavy rains. 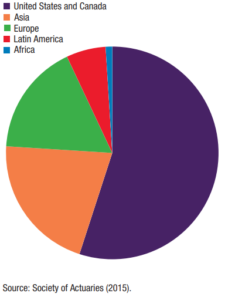 The Society of Actuaries emphasizes Africa’s little involvement with agricultural insurance compared to other continents in 2011, but that number is still significantly low in comparison for this $2 billion industry. And while the agricultural ecosystem calls for attention in all areas—from seed to financing—commitment to agricultural insurance remains difficult to attain for many smallholder farmers, propelling several nations further into food insecurity. According to Atlas Magazine, “over 17 million people living in Ethiopia, Eritrea, Djibouti, Somalia, Uganda, Kenya and South Sudan are under the threat of famine” because of crop losses, but local governments are encouraging agricultural insurance to solve this problem to increase food security and sustainable agricultural practices. Additionally, Drought Portal links the need for agricultural insurance to widespread poverty, stating that “being insured also makes producers more creditworthy, making lenders more likely to grant a loan which could be used for a promising investment opportunity.” Agricultural insurance is one step that many smallholder farmers need to take to exit the poverty cycle, but many are simply unable to do so. The first agricultural insurance policy was marketed in Tanzania, called “Linda Mbegu,” or “insure your crops.” However, crop insurance options have expanded since then. G4AW, or Geodata for Agriculture and Water, has launched an insurance program called Scaling Up Micro-Insurance (SUM), helping farmers in Mali and Uganda with an insurance model that is affordable and inclusive. SUM is an index insurance system that relies on open data which is used to measure crop growth, rainfall, and weather cycles to create insurance products that suit the specific needs of the farmer and the area. Since 2017, the SUM Africa program has sought to provide insurance products for 430,000 farmers within the next three years. CMS Law Tax highlights the ways in which the economies of countries that rely heavily on agriculture are affected when yields are reduced: “it is not just the local farmer, but the economic well-being of the whole country that is adversely affected” because agriculture makes up a large portion of their GDP. In another vein, WorldCover explains that smallholder farmers not only put their crops at risk when they lack insurance but also the state of their household. They emphasize that when nature destroys a farmer’s source of income, they are losing the ability to pay for a number of household expenses, but most importantly their children’s future. When their source of income is destroyed, school fees move down the priority list. In short, the cost of crop insurance is too high for most smallholder farmers. What is more, International Association of Insurance Supervisors emphasize that it is more than affordability that is a problem for smallholder farmers because they do not trust the system. The benefits of what they are paying for is not immediately available. Efforts to accommodate the need for agricultural insurance is being met in untraditional ways across various organizations, but like many sectors, it is about “the know”—knowing where to find it, how to use it effectively, and how it can be beneficial to the farmer and his or her community.